What is Insider Buying and Selling? Insider buying and selling occurs whenever someone who is considered to be an insider of a company – an executive, manager, beneficiary who owns more than 10% of the company’s stock, or employee with knowledge of important company activity – buys or sells stock of their own company. Insider buying and selling can be a good indicator of whether a company will enter a bullish or bearish trend, since insiders have a very strong understanding of a company’s position and outlook in the market. Insider buys and sells are reported publicly to maintain transparency in the markets and these trades are commonly taken by outside investors as indicators of a stock’s future price trends. Insider buying and selling is distinct from “insider trading,” which is illegal and monitored closely by the SEC. It is not illegal for insiders to buy and sell shares of a company. “Insider trading” occurs when an insider buys or sells stock of their company based on information that is not available to the public – for example, an upcoming product announcement or unreleased news of a data breach. 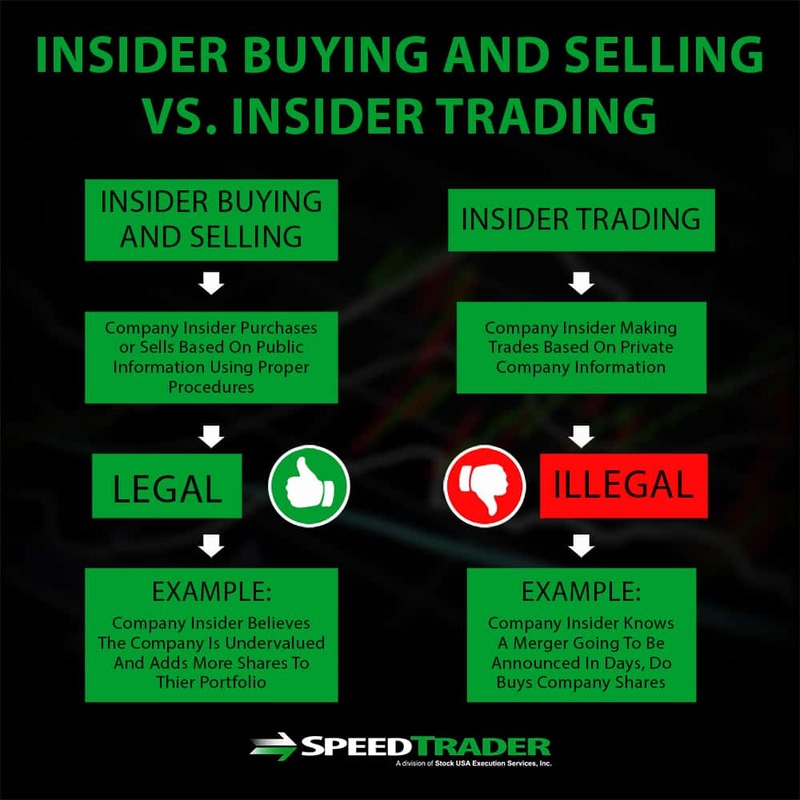 Insider buying and selling, on the other hand, are trades based on publicly available information about the company and are completely legal as long as they are reported to the SEC appropriately. Executives may buy stock when they feel the public has undervalued the company based on their last quarterly report, for example, or sell stock when they expect a future decline in prices. Who Counts as an Insider? Any executive, high-level manager, or beneficiary who owns more than 10% of a company’s voting stock is considered an insider by the SEC when it comes to insider buying and selling. However, with respect to illegal insider trading, the SEC’s definition of who is an insider is relatively broad – it expands to include any employee with knowledge of important non-public company activity and anyone not associated with the company who receives a tip about future activity from an insider. Insider buying and selling must be reported to the SEC within two business days of the transaction, typically through SEC Forms 3, 4, and 5. Transactions listed on Form 4 – which covers the majority of insider buying and selling – are then posted to the SEC’s online EDGAR database for public viewing. In addition, there are many sites, both free and fee-based, that collate the insider buying and selling data posted to the EDGAR database to make it more easily searchable or offer a daily digest of insider transactions. What Does Insider Buying and Selling Mean? Insider buying and selling is commonly used by outside investors as a signal of future trends in a company’s stock price. When insiders buy more shares of their company’s stock, it can be seen as a show of good faith in the company. When insiders sell, it may be viewed as a lack of faith in the company. However, before relying too heavily on insider buying and selling as trading signals, realize that insider buying and selling is completely normal and may have nothing to do with price predictions. For example, many corporate executives are compensated in stock and may need to sell in order to convert stock to liquid cash. One way to gauge the difference between this type of selling and bearish insider selling is the size of the transaction relative to the insider’s total stock holdings. If an executive holds several million shares of a company, their selling several thousand shares is more likely a cash conversion than a bet that the company’s stock price will decline significantly in the future. Large insider buys can indicate faith in the company or a feeling that the stock is undervalued by the public, both of which signal a belief in future bullish activity. Large insider sells, on the other hand, may indicate that competition is picking up or that the stock is overvalued and are indicative of future bearish activity. Insider buying and selling of a significant number of a company’s shares can be a strong indicator that the company’s leadership is expecting bullish or bearish price action in the future. 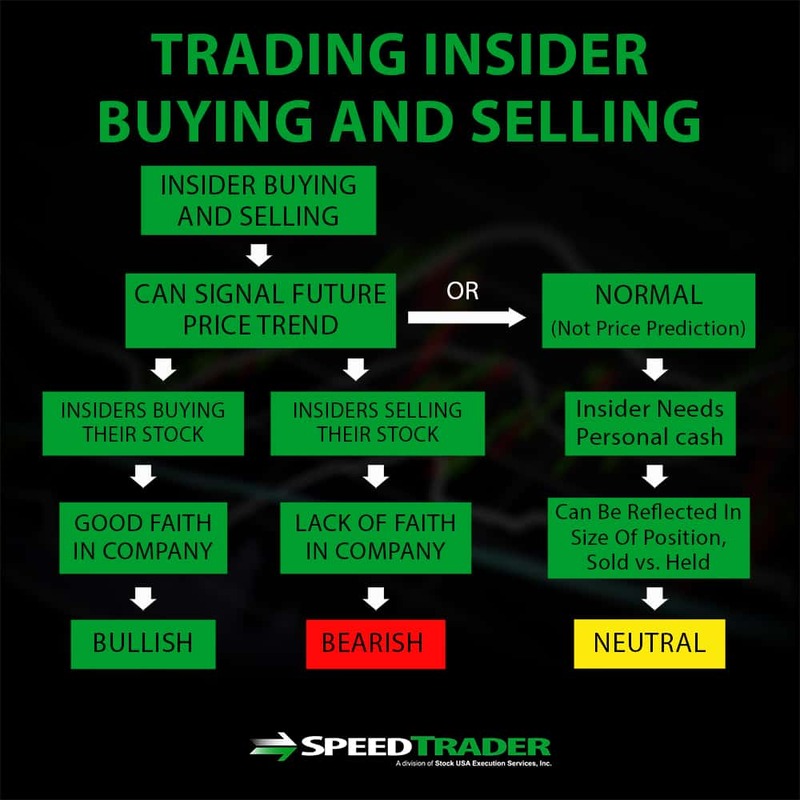 Insider buying and selling is reported to the public, making these trades visible to traders to use as an indicator when making trading decisions. Although insider buying and selling is not a perfect gauge of future price activity, it is commonly cited by expert traders as an important component in decisions to place trades on a company.